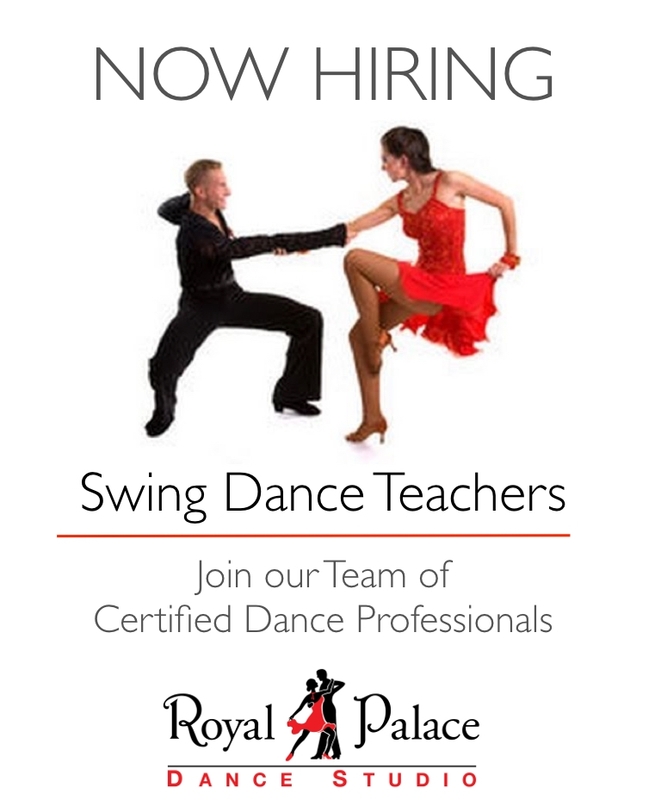 We're looking for experienced ballroom and latin dance instructors to join our dynamic team of outstanding dance professionals. Proficiency in DIVIDA Syllabus American Rhythm and Smooth Styles preferred but not required. Training will be provided but you must be able to self train and quickly get up to speed to pass the Teacher’s Certification Exam to start teaching. In addition to your dance background and desire to teach, you must have a positive attitude, strong communication and organizational skills. Additionally, you must be detail-oriented, a team player, have great phone skills, be reliable, and have a flexible work schedule. 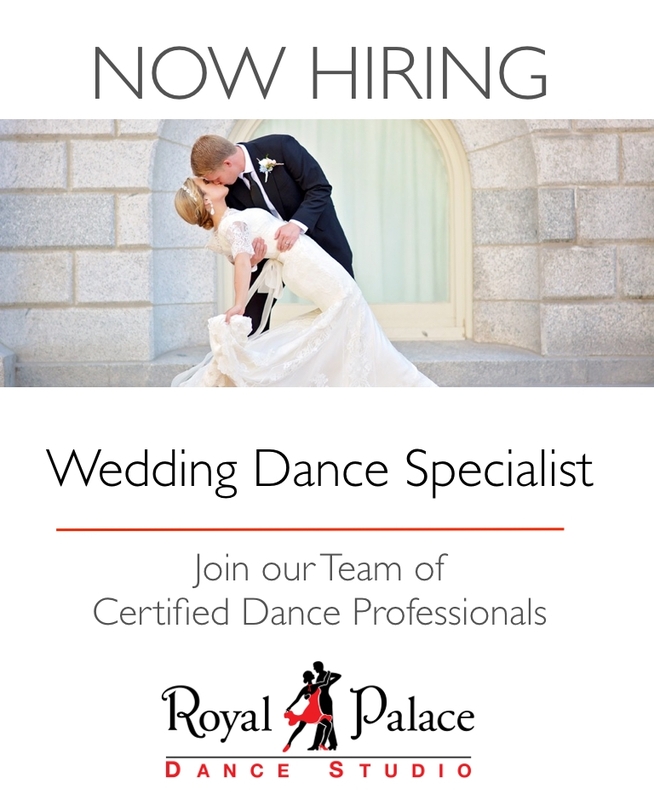 Pay is based on dance, teaching experience, and certification. Please email us your professional resume and biography. We're always looking for great talent to join our team of dance professionals and support staff. If you're smart, talented, driven, and capable of working in a team environment, then we want to meet with you to discuss career opportunities. 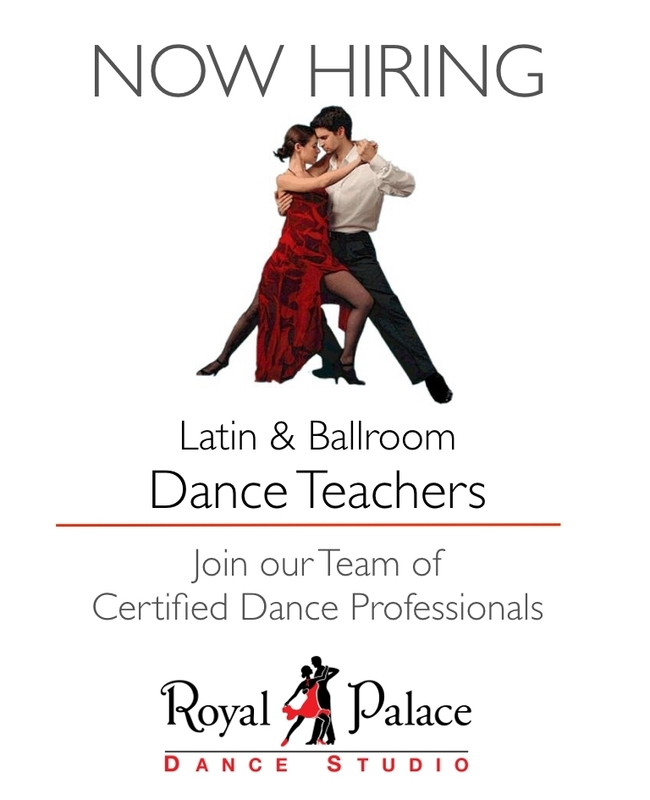 Royal Palace Dance Studio is now accepting applications for experienced ballroom and latin dance instructors to join our dynamic team of dance professionals. Help individuals and couples learn to dance Salsa, Swing, Waltz, Tango, Foxtrot, Cha Cha, Rumba, Merengue, Hustle, Bolero, Mambo, Samba and more. Proficiency in American Rhythm and Smooth Styles with the DIVIDA Syllabus is preferred but not required. Training will be provided but you must be able to self train and quickly get up to speed to pass the Teacher’s Certification Exam before you can start teaching. In addition to your dance background and desire to teach, you must have a positive attitude, strong communication and organizational skills. Additionally, you must be detail-oriented, a team player, have great phone skills, be reliable, trustworthy and have a flexible work schedule. Pay is based on dance background, teaching experience, and certification. To apply for a part-time or full-time career opportunity, please email your professional resume and your dance biography for consideration. Copyright © 2002 Royal Palace Dance Studio, LLC. All rights reserved.